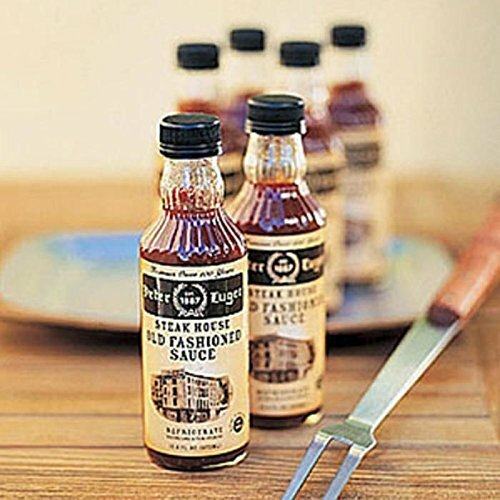 Peter Luger Steak Sauce 6-Bottle Gift Set. Enjoyed by countless steak lovers at the famed Peter Luger Steak House, this world famous sauce is great on lots of things besides steak. Six pack of 12.6 oz. bottles will last all summer long for all of your parties and barbecues. Temperature-controlled cooler will be shipped Fedex right to your house (sorry, no PO boxes, phone number required for delivery, check "Learn More" screen for exact delivery date). Plan ahead! Unlike other mailorder produce, Peter Lugers world famous steak sauce is shipped fresh--not frozen. As such, it must be shipped overnight from the kitchen during their hours of operation. Please refer to the chart below so that you allow the time needed to have this delicious sauce arrive at your door just in time for your family gathering. Six pack of 12.6 oz. bottles.